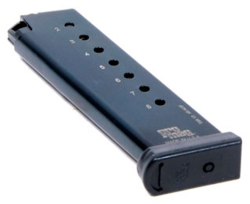 Single-stack 8-rd magazine for the Smith & Wesson 645, 4506, 4566, and 4586 series of pistols in .45acp. Constructed from heat-treated blued-steel, with a follower, lock-plate, and base-plate molded from a proprietary DuPont® Zytel™ based black polymer; and uses a spring wound from Chrome-silicon wire. It has been heat-treated for strength and reliability.